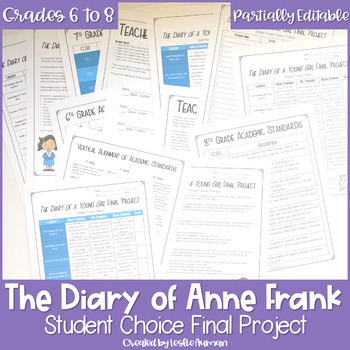 Give your middle school students an engaging summative assessment for The Diary of Anne Frank with this student choice-based final project! 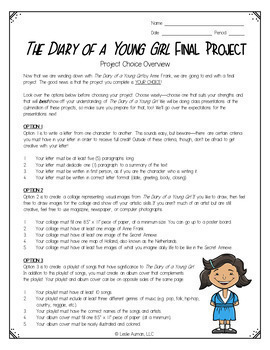 Students get three project options from which they can choose. 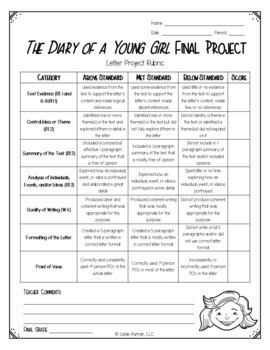 My students LOVED this project, and everything is ready for you to simply print and use -- or you can customize the grading rubrics with the editable PowerPoint file included! Please check out the Preview to get an idea of what is included in this resource! What resources are included in this product for your use? Are you a Texas teacher interested in having this resource aligned to the TEKS? Please email me proof of your purchase of this resource at support@leslieauman.com with a request to have it aligned to the TEKS, and I will get it done for you as soon as possible. What are my recommendations for use in your classroom? 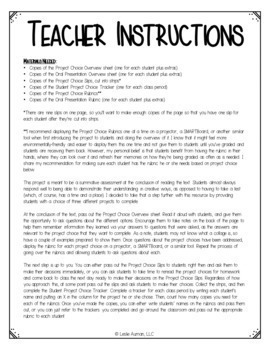 ◾ The teacher instructions pages included provide an in-depth recommendation for structuring and assigning this project. I share ideas for introducing the project to students, helping them understand how they'll be assessed with the rubrics, introducing the oral presentation (which is optional), keeping track of which students are completing which projects, and giving students time to complete the projects. ◾ There are rubrics included for each project choice, as well as for the oral presentation. I've already included benchmarks based on the standards to which this resource is aligned, but I left the score column blank for your use. I also included a PowerPoint file with editable versions of all the rubrics (both black-and-white and color versions) that has the fonts embedded, in case you need to further customize. ◾ There are several different editions of The Diary of Anne Frank available. Please keep in mind that the one I used to create this resource may not be the same as the one you're teaching with in your classroom. What do other customers have to say about this resource?